This is a super simple and speedy dish that just lets the shrimp shine! No reducing of ingredients or sauces required! 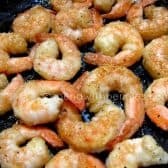 Defrost shrimp under cold running water if frozen. Dab dry with paper towels. In a Ziploc bag, combine flour, lemon pepper, garlic powder, black pepper and salt. Add shrimp to the bag and toss to coat. Heat butter and oil in a large skillet over medium-high heat. Once oil and butter are sizzling, add shrimp and cook until crisp & browned. Flip over and brown the other side. (About 2 minutes per side). Do not overcook!